Class of 2011 | It’s been quite a year for Anna Grassellino Gr’11. In May, the Institute of Electrical and Electronic Engineers announced that she would receive its 2016 Particle Accelerator Science and Technology Award, the ceremony for which took place last month in Chicago. Then, this past summer, the US Particle Accelerator School announced that they were conferring their 2017 Particle Accelerator Science and Technology Award on Grassellino and Alexander Romanenko, her colleague at the Fermi National Accelerator Laboratory near Chicago. Both awards recognize her breakthroughs with superconductivity in particle accelerators, which propel subatomic particles to extremely high velocities, enabling physicists to probe the fundamentals of matter. (Accelerators also produce the most powerful X-rays for many fields.) More specifically, they laud her innovative nitrogen treatment of the accelerator cavities, which reduces resistance for beamlines of those high-velocity subatomic particles. The awards—which Grassellino says are “important recognition of the work, not just mine, but the team here at Fermilab”—come just two years after she received the Department of Energy’s Early Career Research Award, which has provided $2.5 million in research support over a five-year period. Grassellino’s journey began in the Sicilian city of Marsala, and she fondly recalls the hometown math teachers who recognized and inspired her native talent. For her bachelor’s and master’s degrees, Grassellino went north to study electronic engineering at the University of Pisa, whose alumni include the likes of Galileo and Enrico Fermi. In 2004, Grassellino spent the summer in a student program at Fermilab. There she met Penn physics professor Nigel Lockyer, then a lead experimenter at the lab and its director since 2013, who encouraged the summer students to pursue studies in advanced physics. The idea appealed to Grassellino, in part because she thought physics would foster her creativity. And so, the following year, she began her PhD studies at Penn. After finishing her class work in Philadelphia, Grassellino went to Vancouver to do her PhD research at TRIUMF, Canada’s leading particle physics and accelerator lab. Lockyer, who taught at Penn from 1984 to 2007, was appointed TRIUMF’s director in 2007, and his Penn physics students had the opportunity to join him there for their research. Given Grassellino’s focus on accelerator physics, it was a unique prospect. At TRIUMF, Grassellino investigated the superconductivity radio frequency (SRF) fundamentals and technology of accelerators, and her dissertation focused on the breakdown of superconductivity in the inner cavities. After TRIUMF, Grassellino returned to Fermilab as a post-doc to work on superconductivity. She began exploring how a new surface addition of nitrogen nitrite to the accelerator’s niobium cavities might improve performance. Though she and her group concluded that the nitrite mix did not enhance superconductivity, they noticed that once it was removed, some residual nitrogen, known as the “nitrogen tail,” significantly improved superconductivity. 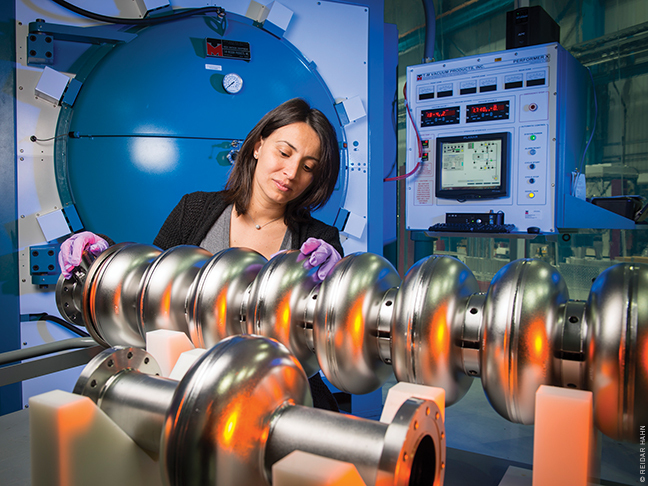 Grassellino and her colleagues at Fermilab and Jefferson National Lab will soon be implementing her findings with the LCLS II electron beam accelerator, still under construction at SLAC National Laboratory at Stanford University. LCLS II will generate high-powered x-rays, superseding the currently operating LCLS I, which has enabled major findings in health and other scientific fields. “Anna, by my measure, has had a huge impact on this project, because the performance has been enhanced substantially by her research, which is recognized around the world now,” Lockyer says. The LCLS II work is now at a stage in which private firms that supply accelerator parts are reproducing Grassellino’s innovation and offering improvements. While the journey continues, for Grassellino it has also come full circle. The DOE award enables her to employ post-docs, whom Grassellino sees as representing the future. And there is real satisfaction in seeing ideas, intuitions, and hard work fulfilled.